Touching on everything from politics to pop culture subjects, the program examined the week’s headlines. The hosts also spoke with a wide range of guests including authors, journalists, newsmakers and entertainers. Various news items were covered until the end of the episode. Dressed in a white evening gown, Chung sang a parody version of “Thanks for the Memories.” The off-key performance became very popular on the Internet and ironically was viewed by far more people than watched the regular show. • The series was pulled after six months on the air due to very low ratings. • In April 2006, allegations were made that Povich made sexual advances towards a woman on the talk show staff. MSNBC maintained the cancellation had nothing to do with the charges. Ironically, the week after the allegations were made, the show experienced its highest ratings. 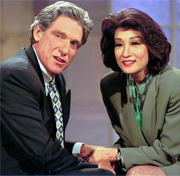 Weekends with Maury & Connie: Thanks for the Memories?